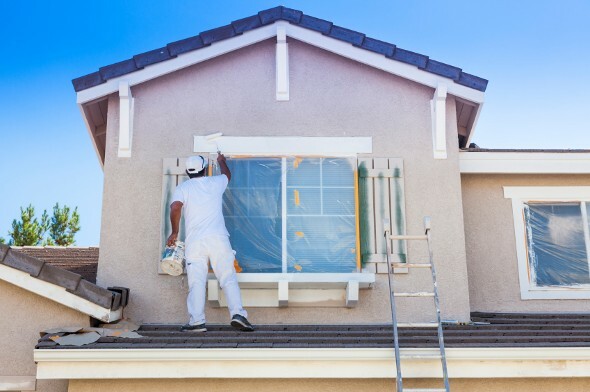 Whether you just recently purchased your first home or you want to spruce up a house you’ve lived in for a while, a new paint job can be a great way to refresh your property. Concerned about what that might cost? Here’s everything you need to know about the average cost to paint a house. We’ll cover both interior and exterior paint jobs. How Much Does It Cost to Paint the Exterior of a House? 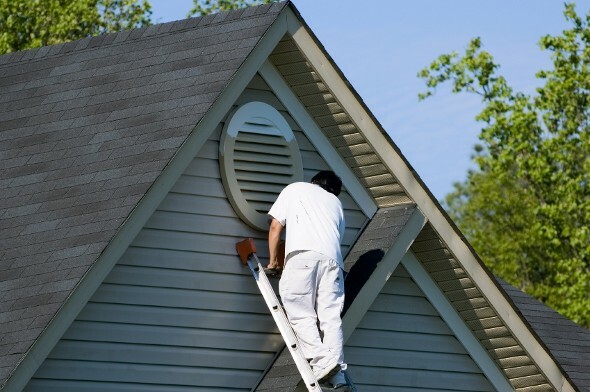 The average cost to paint the exterior of a home is $2,580. That’s according to Homeadvisor, whose members report an average cost of an exterior paint job that starts at $800 and goes up to $5,400. Most homeowners who use the site report spending between $1,715 and $3,676. The average cost to paint a house depends on several variables, but the biggest one is size. The cost to paint the exterior of a 1,500 square-foot home will naturally be lower than the cost to paint a 6,000 square-foot home. A starting point of around $1,000 is a safe bet. But if your home has multiple stories or has old paint that needs to be scraped, you can expect to pay more. So is there a formula that links home size to the cost of a paint job? Opinions differ. First, measure the exterior square footage of your home and multiply it by the height of your home, from the ground to the roof line. Subtract windows and doors you don’t plan to paint if you feel like getting fancy. You can also subtract window trims if you plan on painting them with an accent color. Once you have the approximate square footage that you’ll need to paint, remember that a gallon of paint generally covers between 250 and 400 square feet. You’ll need more if you’re painting a rough, porous material, or if you want to paint a dark house a much lighter color. Depending on your color choice, you may need a more expensive tinted primer to help with the color transition. The average cost to paint the interior of a house falls between $1.50 and $3.50 per square foot. If you’re doing the ceilings, walls and trim, the cost per square foot will likely fall between $3 and $4. If there is damage to the walls that needs to be repaired before painting can proceed, you’ll pay extra. These are the average costs if you pay a service provider to paint your home for you. You may also choose to do the paint job yourself. Homeowners are more likely to tackle an interior paint job themselves than to take the DIY route for an exterior paint job. That, plus the cost of the paint itself, means that an interior paint job is generally cheaper than an exterior one. And it can be a great way to refresh your space without buying all new furniture or making more costly and time-consuming renovations. To calculate the cost of an interior paint job that you do yourself, measure the square footage of the interior space you need to paint. Consider whether you will need primer or multiple coats to help with your color transition. If you’re just adding another layer of the same color of paint you used a few years back, you may be able to use a single coat and skip the primer. Once you have the interior square footage calculated, experts say you’ll want to divide by 350. 350 square feet is the average coverage of a gallon of paint (though some say 250-400 square feet). The average coverage for a gallon of primer is 200 square feet. Your square footage divided by 350 square feet gets you the number of gallons of paint you’ll need. Square footage divided by 200 gets you the number of gallons of primer you’ll need. You can save money by ensuring you don’t buy too much paint. From there, you can calculate the cost of the paint job based on the per-gallon price of your paint brand of choice. If you need to buy equipment like ladders, paint guns, brushes, etc. remember to factor those prices into your calculation. Aside from the size and the material of your home, there are several factors that affect how much it costs to paint your home. If you paint the home yourself you’ll almost certainly spend less than you would if you hired professional painters. If you’re doing a cost comparison, remember to include the cost of painting equipment when you’re tallying the cost of a DIY paint job. You’ll need a ladder, brushes and buckets in addition to the paint itself. For an interior job, you’ll probably want tape and a drop cloth. Another factor that affects the cost of painting a house is the paint itself. Different brands come in at different price points. When you’re selecting paint at the hardware store, don’t be afraid to mention your budget to the member of staff who’s helping you. You can also consult the web for recommendations on affordable paint. If you want a super-premium look or paint with minimal fumes you’ll pay extra. You can also save money by shopping around for painters and getting bids from different service providers. Start with recommendations from friends, neighbors and trusted websites and from there get quotes for how much the paint job will cost. If you go with the first price you’re quoted, you might miss out on a bargain. And if you rent your home, be sure to check with your landlord to make sure painting your space is allowed. A financial advisor can help you take control of your budget. A matching tool like SmartAdvisor can help you find an advisor to work with to meet your needs. First you’ll answer a series of questions about your situation and your goals. Then the program narrows down thousands of advisors to up to three who meet your needs and are in your area. You can then read their profiles to learn more about them, interview them on the phone or in person and choose who to work with in the future. This allows you to find a good fit while doing much of the hard work for you. Shop around for the best savings account. If you’re saving for short-term financial goals, like buying a new computer or a new car, a high-yield savings account can be a great place to put your money. Online-only banks like Ally and Marcus by Goldman Sachs have some of the best interest rates so you’ll able to put your money to work.